To catch up with an old high school friend whom I met on the subway (what are the chances of that happening in NY? 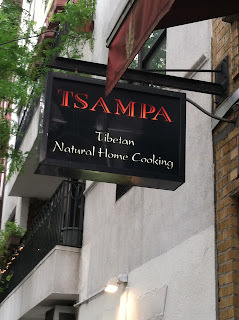 ), we went to Tsampa, a Tibetan restaurant in East Village. He's going to NYU in September, so it was a great way to introduce to him the hippie grungy culture of St. Mark's Place. Had we listened to the sign on the door that read "Sorry, private party inside", we wouldn't have gotten a seat. I took a peak inside to find no such deal, or at least not on the outside dining room. So I went inside and asked for a seat (very Chinese of me, I apologize). The waitress dressed in traditional Tibetan garbs was quite nice, and after consulting her manager she sat us down. The place was dark-lit, with some candles flickering here and there. 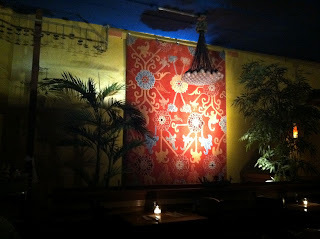 The decor was eccentric, but in tune with Tibetan themes of nature and reverence to the heavens. An intricate hand-woven carpet hung over the wall, next to a funky light-bulb chandelier. I liked the wind chimes (upper left-hand side), just too bad we weren't actually on the Tibetan plateaus to hear them chime. There was an abundance of green life all over the restaurant, which at first glance is pretty small but actually opens up to a long corridor. I almost couldn't read our menu until my eyes adjusted to the darkness. This would be a great place for a blind date, especially if you don't really want to see eye-to-eye with a stranger. As I came back from the restroom, I noticed that I was sitting directly under a giant portrait of the Dalai Lama. Then as I was chatting with my friend, soft Tibetan music came in the background, which made you feel at once at Zen. 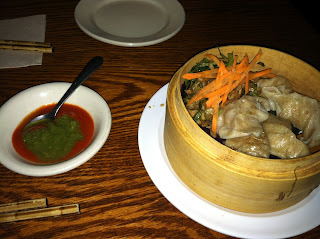 For starters, we ordered the chicken and vegetable dumplings, or momo as they call it. These came in a small bamboo basket of 5 for $5. They were a little bland, so you have to use the hot sauce (the red and green combination to the left of the basket). The skin was probably hand-made, but it was tough and overcooked. Later I found out that's because it's made out of buckwheat, which explains the chewiness. Hubby couldn't take spicy sauce, so he got a real kick out of even a small drop of the red+green sauce. Perhaps because of my recent Flushing experience, I was alright with it. I found the carrot and chicken salad at the side a lot more refreshing. It was crunchy and tangy, expertly seasoned with sugar, ginger and vinegar. Being foreign to the Tibetan cuisine, we couldn't decipher most of what was on the menu. However we did discover two excellent dishes (the curry was recommended by a lot of bloggers). The one on the left is the vegetarian potato and vegetables stir-fry (not sure what to call it) with a serving of bread. Absolutely amazing. The potatoes were tender, and the red peppers added to the texture. The leafy greens made you free a whole lot healthier from packing in all that starch. And the pita bread was divine. Perhaps it was just regular pita bread, but it was soft, flourly and when eaten with the curry, it just melts into the spices. The dish on the left was chicken and potatoes soaked in Tibetan curry, which tasted almost like Japanese curry but not as bland. 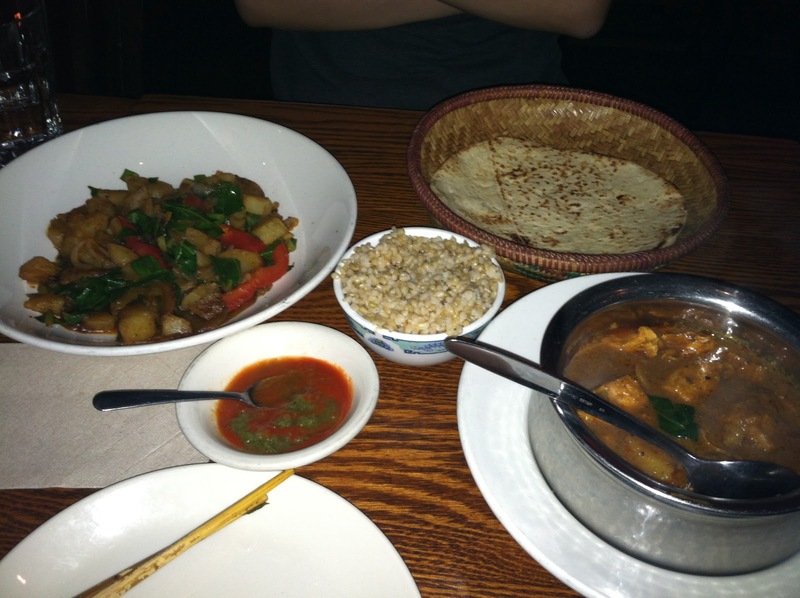 The spices were not overwhelming, instead, they were aromatic and complex - gingery, soy saucy and garlicky. The brown rice that accompanied it was alright, but it was too grainy for my liking. Finally, we had the Tibetan bocha - tea with butter tea. 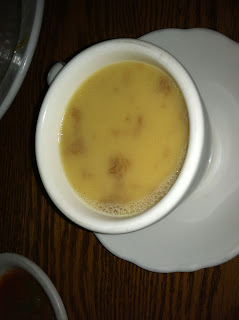 I asked for this during our meal, which in hindsight was a great idea, since it had the texture and taste of a salty milky soup. It was a bit too much to handle. I really enjoyed my time here. The staff was super helpful, every glance you make at them ushers them over to bring you more water or food. It's a pretty nice restaurant (except you can't really see what you're doing) especially great for catching up with old friends.